Stunning Hit Show about Mick Ronson returns to Hull Truck Theatre. ‘Turn and Face the Strange’ is back at Hull Truck in April 2019. 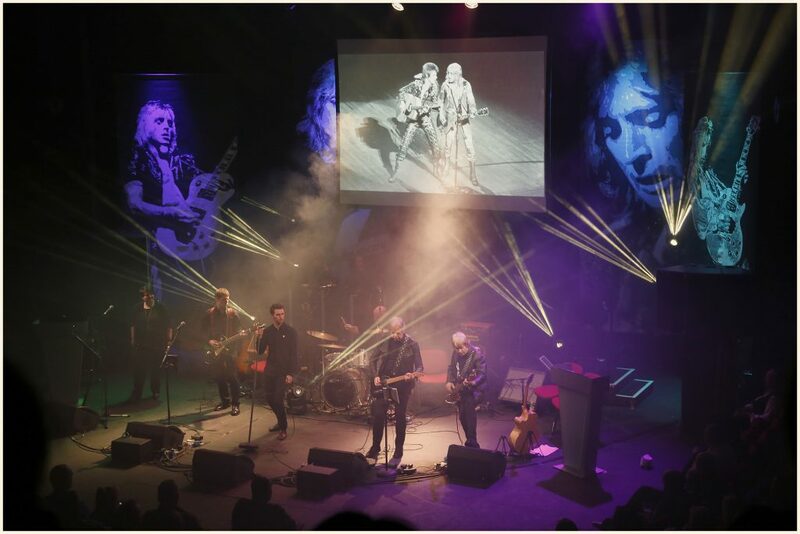 The powerful multi-media show tells the story of Hull born Mick Ronson who played alongside David Bowie as one of the Spiders from Mars, and became a world-famous musician, arranger and album producer. The show was originally commissioned as part of Hull’s City of Culture year playing to sell-out audiences at the Freedom Centre in August 2017, followed by a further sell-out run at Hull Truck in February 2018. In August a specially adapted version of the cult show opened the new Spiders from Mars stage at the annual Sesh Festival wowing an audience of thousands. It’s back at Hull Truck with an ever growing team of talented performers, crew and volunteers. The show has attracted sponsorship from local partners including Hull College, Kexgill, and the Hilton Doubletree Hotel. The company will be working with Hull College to develop educational opportunities for students in music, fashion and design. The Hilton Doubletree Hotel in Hull will be offering special discounted rooms for ticket-holders, so visitors and locals alike can enjoy a really special night out. Richard Stott, Group Managing Director of Kexgill and the University Quarter is delighted to be a partner on the production: “Creating the Spiders from Mars house in Hull’s University Quarter was our opportunity to create a lasting tribute to the band. We are thrilled an acoustic set will be performed there by the participants of the brilliant Turn and Face the Strange. Supporting the present vibrant Hull music scene and influential worldwide heroes of the past is so important culturally to our proud City”. Turn and Face the Strange will play Hull Truck’s main Heron Auditorium for two weeks from April 25th to May 4th 2019 with additional matinee shows on both Saturdays. The stellar line-up of talent includes rock musicians who played with Mick Ronson and David Bowie, with Keith ‘Ched’ Cheesman (The Rats) John Cambridge (The Rats & The Hype), John Bentley (Squeeze), alongside Kristian Eastwood, Bobby Joyce, Rachael Jarvis & Phil Keech. With a string quartet of classically-trained young musicians ‘Turn and Face the Strange’ tells the real story of the Man Who Changed the Music World. Be the first to comment on "Stunning Hit Show about Mick Ronson returns to Hull Truck Theatre."